Paris/London 2015 - Getting where? So my quick trip to Paris and London was pretty full-on. I crammed a lot into less than a week, but it was good fun. I don’t have any pictures of the London portion, but this whole trip grew out of the need to go down there so I could get a bridesmaid’s dress from David’s Bridal in Stratford. And that went just about as you’d expect spending two hours in a large American chain bridal store on a Saturday would go. Eeesh. I did pick out a nice dress though, and I didn’t even have to carry it home because it needed ordering, so that was pretty successful. I then headed straight for the chaotic centre of London to check out the Revival Retro boutique, which was the complete opposite experience. Absolutely lovely and everything on the sale rack was in my size (NEVER HAPPENS). I straight CLEANED UP in terms of vintage style early birthday presents to myself, including this dress, which I love love love. If only I were so lucky every time I had to get new clothes. Anyway, after that, I grabbed some gelato at Gelupo to bring back to my fantastic hosts’ place for dessert. I stayed with David who I went to college with, his husband Jason and their housemate Krysta. They made me dinner and cocktails and had great chat and wine (Jason is a wine seller, check out his shop if you’re in London!) and were pretty much impeccable in every way. Sunday, I met my friend Chloe and we had an epic Sunday roast in a pub then a walk along the river in the sun before wiling a away the afternoon before my flight out of London City in The Understudy, which is a great new bar at the National Theatre looking out on the river. Excellent beer AND coffee. My full Flickr set for Paris. 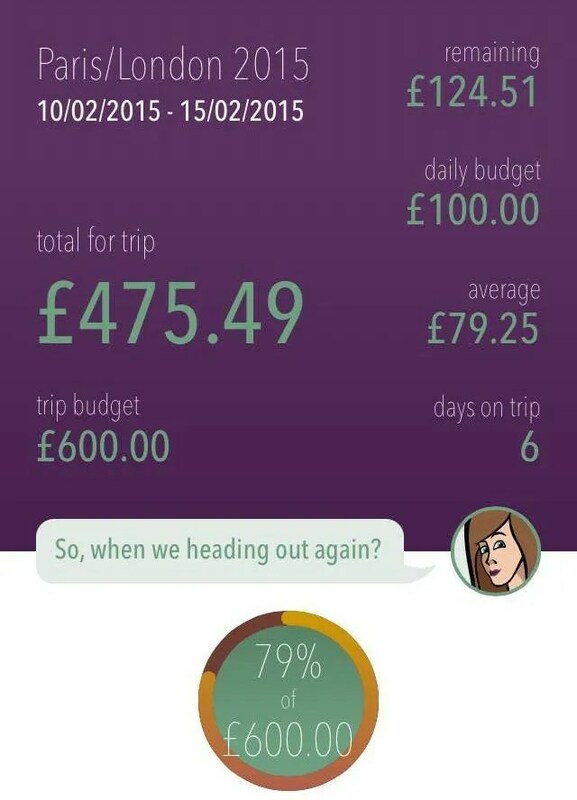 At 6 days, 5 nights, that’s an average of £79.25 per day. Higher than my average for Finland, which was slightly surprising, but I did pay for accommodation for part of this trip, and I didn’t do that in Finland. I’m loving the updates to Trail Wallet by the way! £187.90 on food and drink. I TOLD YOU this trip was all about eating. This was my biggest expense, and I’m perfectly happy with that. £113.95 on transport. This is mostly local public transport, as I only spent £35 on the flights since I got them with BA miles/Avios. £9.76 on entertainment. A ticket to the Louvre and a donation at Notre Dame. I did so much walking and wandering on this trip that most of my entertainment was free. The Louvre is kind of expensive, but I’d say it’s justified. £125.00 on accommodation. My first Airbnb, which was fantastic! I’ll definitely be using it much more now. £3.70 on stuff for me. This was some travel bits and pieces at Muji in London. £35.18 on gifts. For my hosts and for a few treats to bring in to work.